The item Once Upon A Wish : True Inspirational Stories of Make-A-Wish Children, (ebook) represents a specific, individual, material embodiment of a distinct intellectual or artistic creation found in Charlotte Mecklenburg Library. Real-life stories about the foundation that has made dreams come true for hundreds of thousands of children. Sometimes all it takes is one special day, one magical moment, one fulfilled wish to learn how to laugh and be a child again. For decades, the Make-A-Wish Foundationʼ has granted wishes worldwide to children battling life-threatening illnesses, shedding light on worlds darkened by disease and bringing hope to children and their families. 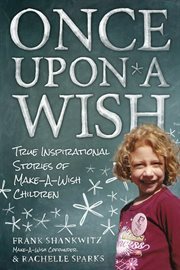 With a foreword by Make-A-Wishʼ cofounder Frank Shankwitz, Once Upon a Wish shares the stories of eight children-inspiring testimonials to the resilience and strength of the human spirit. These families generously invite us into their worlds, allowing us to become part of their darkest moments, their unimaginable realities, their greatest hopes, deepest fears, and unbelievable triumphs. Experience the story of Katelyn, a little girl who became a medical marvel after defying all odds stacked against her and making it her life-long goal to raise $3 million for St. Jude Hospital; read about a wheelchair-bound boy, Garrett, giving the gift of mobility to disabled Cambodian men and women; and root for the family of a little boy, Dakota, who collects millions of pennies each year to help others fight the disease they once fought. Become inspired and forever changed by the generosity, hope, courage, and optimism of these children and their families and experience the power of two words, "I wish."